A British band who secured success in the United States in the 1960s has been inducted into the Rock and Roll Hall of Fame. 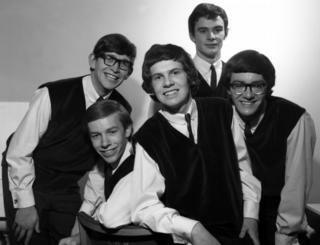 The Zombies, who were formed in St Albans in 1961, enjoyed two number ones in the US. Keyboardist and vocalist Rod Argent, a former choirboy at St Albans Abbey, and singer Colin Blunstone were at the ceremony in New York. Blunstone said in 1961 he thought it would only be "a two-year adventure". During a ceremony at Brooklyn's Barclays Center, the group performed a set which included their hits Time of the Season and She's Not There. Argent said: "It's an extraordinary result after so many years." He said that when he and Blunstone got back together about 19 years ago they only did it "because it was a buzz". "We didn't expect any career thing out of it, but we've built such a second incarnation here and played to big houses," he said. The band's journey started in April 1961 in St Albans when all five original members of the group - Rod Argent, Paul Atkinson, Hugh Grundy, Chris White and Colin Blunstone - met at the Blacksmith's Arms pub and went onto the Pioneer Club where they had their very first rehearsal. Later they won a local music competition, where the prize was to record a song. That track, She's Not There in 1964, changed their lives forever - although the band was only a "one hit wonder" in the UK. Blunstone said he thought their success wouldn't last. "When the Zombies first became a professional band I didn't realise you could have a lifetime career in the music business, I thought it was a two-year adventure," he said. The second incarnation of The Zombies in 1999/2000 has lasted three times as long as the first and Argent said he was "immensely proud". The Rock and Roll Hall of Fame recognises the world's most influential music artists, who become eligible 25 years after the release of their debut album.